This attractive perennial is a great addition to a wetland environment. It is tolerant of a saltwater estuary environment. The bright yellow flowers sell the plant but the leaves are attractive with silver undersides. 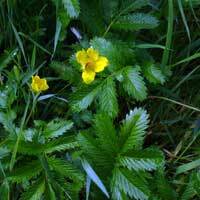 Silverweed will spread by above ground runners similar to strawberries.